Ok, so sweeties, I suppose I should have told you before but it has been two weeks since I can OFFICIALLY DRIVE MYSELF! Here in Australia, we have a crazy (grudgingly safe) rule that after passing a computer test, you got to drive 120 hours with a fully licensed driver (heart ache of every parent or in my case, granddaddy! ), that is actually 5 days of complete and utter driving nonstop. Though I did mine in around 1 year. No getting them Ps without your gorgeous 17th birthday though! And then the big guns. Some hot shot driver takes you for a test drive. EEEEK! Now I have watched enough American TV to know that happens there too! The strawberry is gone, c’est fini! Ice cream/cream/both to serve – because without it… what do you have left? Congratulations on your drivers license!! That is probably the most exciting time in any young person’s life 🙂 Chocolate is second! Congrats! And wow this dessert looks gooey good!! Congratulations Uru, on your drivers license! Definitely a time to celebrate! The cakes are beautiful. Congratulations Uru! My first driver’s license is from the US. I failed on driving test once (I went on an opposite road just like how we drive in Japan – but I never drove in Japan haha!). But luckily I passed on my 2nd time. I couldn’t go on fast freeway for half year too. Enjoy driving!! Congratulations! Now if you run out of baking ingredients mid-bake you can drive to get supplies! Big congrats Uru! Can you hear my applause all the way from here. That’s truly awesome and you must be thrilled not only with your license but this incredible cake and it’s molten layers, dark chocolate and ooezy glaze. Bliss! YUMM! Looks incredible. Congrats on the license too! Aaahhh I wanna dip a spoon right onto my computer screen! This looks sooo good! Congrats CCU! And this cake is certainly a way to celebrate! want to ship those little chocolatey beauties all the way to chicago?lol. Congrats on getting your driver’s license! that’s great news! This dessert is a really good one to celebrate it with! yes! Congratulations! This looks so good I could just dive in. The driving protocols are pretty much the same here in Canada with you guys there in Australia. I guess it’s because we’re from the same Commonwealth? LOL. Congrats on your driving licence! Be safe always! Don’t drink and drive – don’t eat and drive. 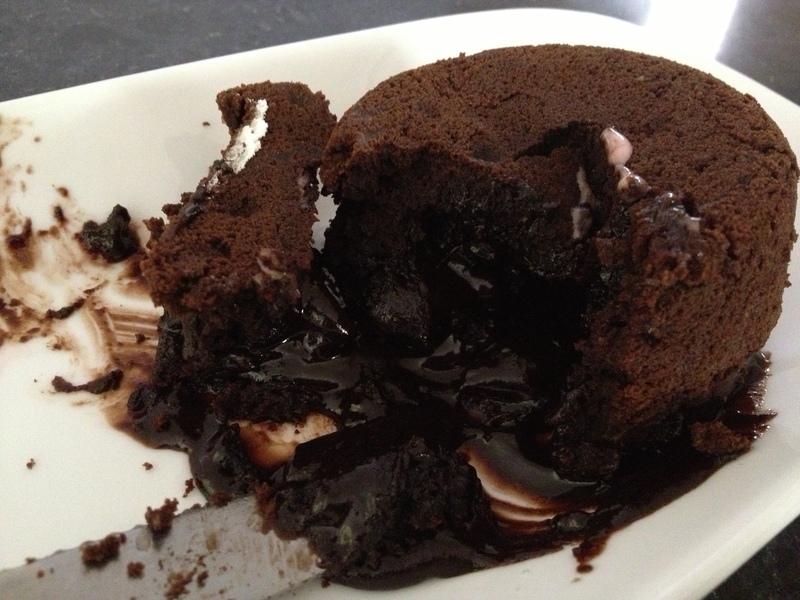 it gets dangerous, too – especially when they are these oozy molten-centred pudding! YUM with a capital Y! Congratulations! And this looks just delicious, my friend! CONGRATULATIONS CCU! 🙂 How terribly exciting! Be safe, don’t let your friends distract you and never ever text or phone and drive. Sorry sweetie that is the mother hen in me coming out. My son has been driving two years and I still worry all the time when he is driving the crazy LA highways. That chocolate melted dream thingy looks like the very best dessert ever and the one I would request if I could request a birthday cake from one of my very favorite bloggers, CCU. Congrats, Uru! How exciting (and scary for the other drivers out there, lol 😉 I was terrified when I was learning to drive. Your driving scenarios cracked me up – I’m sure you’ll be making those comments and hitting the open road soon enough. 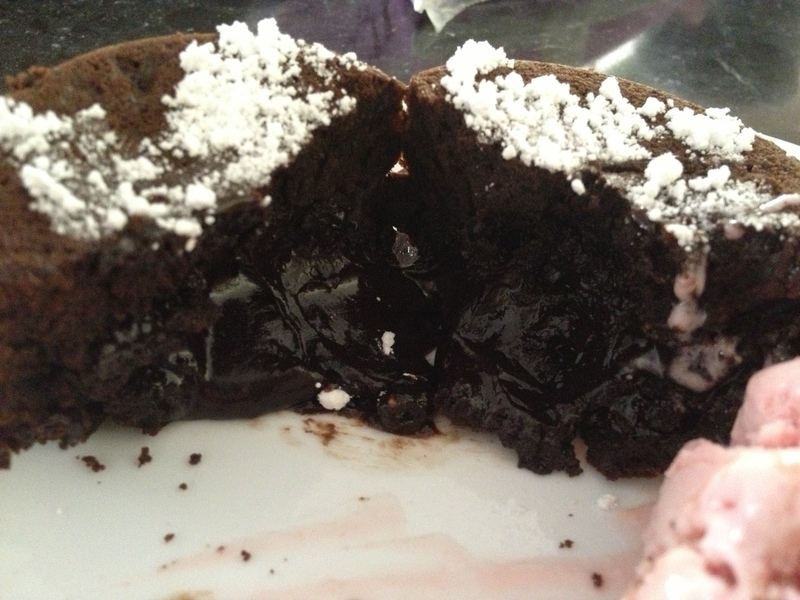 As for these lava cakes – OH EM GEE they look amazing! So dark, decadent and ooey gooey, exactly how they should be. Congrats on getting your license. I have a feeling your parents won’t see you as much anymore, lol. I know when my daughter got hers she made lots of extra trips to the store. Oh gosh it feels like forever since I took my test- I was 16! I believe here in NH you start of with your learners permit when you are 15 1/2 where you can drive with your parents or another licensed driver over 21. then you take Drivers Ed which is a 6 week Class, a Written Test, A Driving Test and then you get your License! I think you might have to log in more hours after for like 90 days if you are under 18 – we also have a points system, if you are in a accident or get a ticket/warning you get points on your license if you are under 21 -too many points and you get your license suspended for 30, 60 or 90 days! Good luck with your new freedom! Woohoo!!! Congratulations! I learned how to drive years ago and have my license…but probably haven’t actually driven in…four years. Seriously. Sigh. 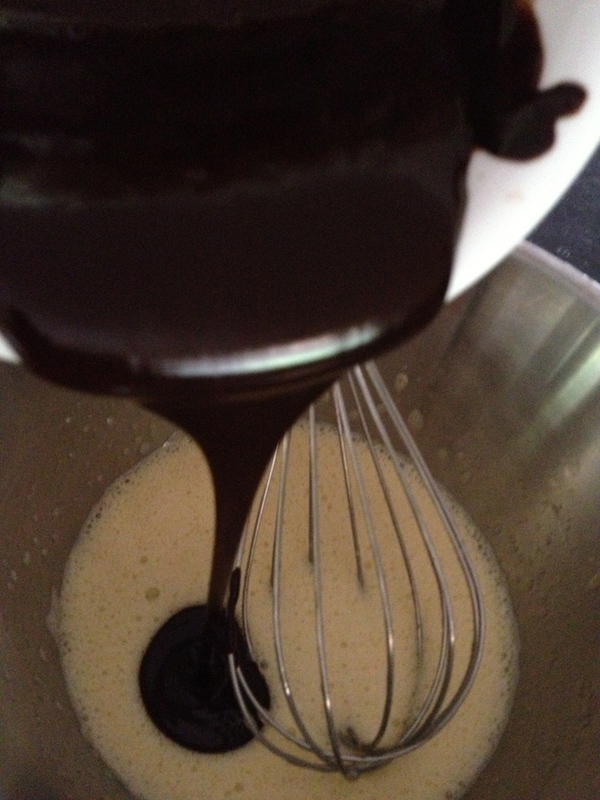 Super recipe…the darker the chocolate, the better I like it! Congrats on the license! Now you can drive to more places with yummy food! Getting my driving license in US was a nightmare. But that’s a story for another time. Congrats on your driving,be safe. I love to be in passenger seat rather than in driver seat. By the way your chocolate cake is looks delicious. Congratulations on driving! Such a freeing experience that only gets old once you start “commuting”. haha! Love the chocolate! Looks heavenly! Congratulations! That is such a happy news. 🙂 It’s a good thing that the rules are tight for getting a license. It’s WAY too easy in the States (at least in CA), and some people on the road are just too dangerous. 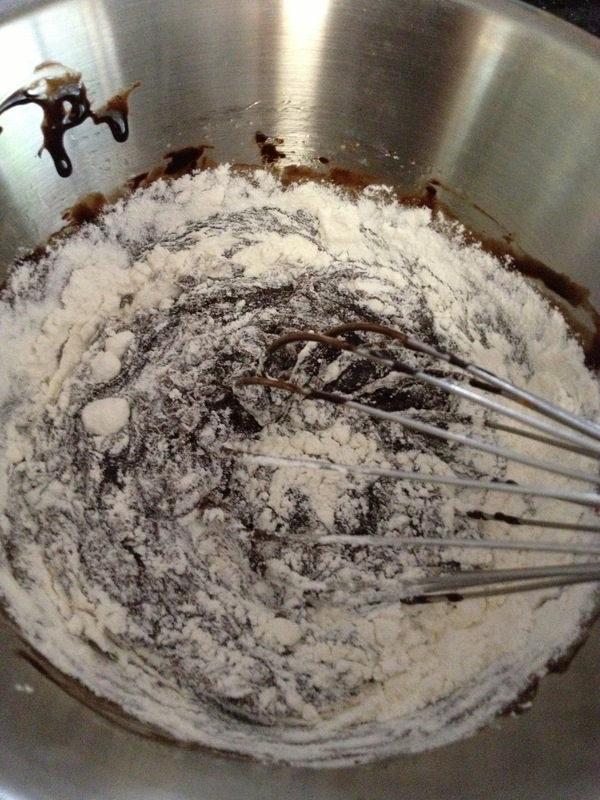 Your cakes look amazing….I love the warm gooey melt-y interior! So decadent! Congrats on getting your license! I was super nervous on my first try. But I finally passed on my second try. I almost cried tears of joy. It’s such an exciting experience! Yay for driving! You’re going to love the freedom and cupcake runs 🙂 This chocolatey dessert looks bonkers amazing! Congratulations on getting your license! I remember my road trip like it was yesterday, not #$% years ago. Love the look of these little cakes. Congratulations on the license! Way to go, girl! Anything with chocolate spilling out of it like that must be good. Congrats. Getting your licence is such a monumental occasion. So glad you are celebrating in style. I can barely remember my driving test, it’s been that long ago! But I did pass the first time. Now our driving criteria has become stricter since I got my license. I loved having my driver’s license, my only issue was my dad’s hideous blue dodge station wagon…you just cannot look cool in such a lame automobile. Sigh. This celebration cake is perfect. Hope you stay safe. I can’t wait to work and buy my own! Your chocolate dessert looks insanely delicious! I have always wanted to try this out at home. After seeing the photos I am inspired to for sure. I too always use Lindt chocolate. The better the quality the better your dish will taste. 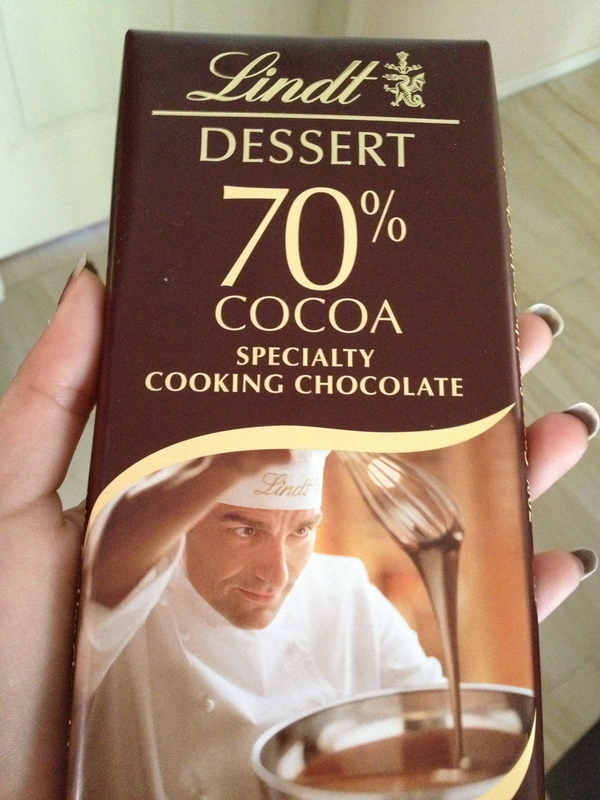 I have not yet seen a cooking chocolate Lindt bar so I just use the regular one. Woohoo, Uru! Congrats on this major accomplishment! Back in the day (waaaaay back) we had to take “Driver’s Ed” when we turned 15 — basically, three student drivers piled into a car with an instructor (one wanna-be driver behind the wheel and two in the back seat patiently awaiting their turn — and/or snickering and giggling — it was awful.) The instructor sat in the front seat with his foot near a “dual brake” in case we went too fast. 🙂 Then we had to wait until we were 16 to take the official license test, which thankfully, I passed the first time. I’m so glad that’s over. And I’m soooo glad you made cake to celebrate! There will be no stopping you now…I’m sure there will be plenty of adventures ahead. I would celebrate any occasion with your delicious looking dessert. Congratulations! I remember getting my driver’s license a bunch of years ago. I was SO nervous for the written test and driving test but in the end, it was easy! =) I love the dessert you celebrated with – it looks SO good! Congrats! Congrats and congrats! It’s the best feeling in the world to be able to drive yourself. Awwww, the independence! And as for this chocolatey, decadent treat – I’m in a puddle of drool thanks to you. It looks soooo good! Well done on getting your licence! There’ll be no stopping you now!! I remember getting my licence quite clearly…what a nerve-racking experience!! That cake just looks awesome, so delicious! I want, no I need, some chocolate now! Congrats, sweetie! Bet u’ve been driving around the city. Stay safe! In Greece we get our driver’s license at the age of 18. We take some lessons from a teacher and then we have written and oral exams. I took mine at the age of 19 and failed the first time so I had to pass the oral exam twice. It was such fun starting to drive on my own! Your puddings are finger licking! Congratulations on your license! How very exciting! Just stay safe my friend! What a chocolate, chocolate dessert! Perfect for a big glass of milk! Access to wheels? Oh, a whole new world awaits you. How exciting! The cake looks delicious! congrats on your drivers license. the chocolate seems a great way to celebrate! Oh I would so give up my license for that chocolate lovely! Congratulations & please be careful out there – see I do it for my own daughter, my husband, & now I’ll say it to you too. In Massachusetts they’ve started with stricter requirements. It’s now called a junior operator’s license that you can apply for at 16 1/2 until 18 yrs. old. You have to attend driver’s education classroom, then road driving with an instructor & a number of hours w/a parent. But now parents have to attend a class too. Once you pass your driving test you can’t drive between 12:30 – 5:00 am and you can’t have anyone in the car who is under 21 (unless there’s someone 21 or older in the car with you). But the biggest thing now is, that if there is any violation of those rules or tickets then you lose your license & get fined. Ooohhh …. Lava cake! or surprise cake, either way it’s the BEST and you make it look so good. Your chocolate cake is just my kind of cake. Great way to celebrate, congrats. Congrats!!! This made me realize that I have been driving for about 10 years now. Time to go cry :p These little chocolate pudding surprises look AMAZING!! Congrats on driving!! How fun for you! This recipe is SOOOOOO up my alley right now… overflowing chocolate, yum! Congratulations! I do remember my driving test (even though it was many, many years ago!) and how I was so nervous I failed. All’s well that ends well – my parents took me back the next day and I passed! Stay safe and enjoy your new freedom! Allen. Congratulations to you! Driving gives you such freedom. Drool! These look so rich and decadent! Congrats! What a wonderful milestone. Driving changes everything. As always your cakes are fabulous. Congratulations on your license! It is quite exhilirating at first to be able to drive independently! 🙂 Your dessert looks delicious! Congratulations on getting your P’s! I was soo excited when I finally got mine and that taste of freedom is pretty fun 🙂 These fondant puds look amazing – love the oozy chocolate centre! Congratulations my honey!! (…and thanks for the warning) Lol, just joking 😉 so pleased you got your license. On the topic of the chocolate fondant cake YUM!!! I enjoy winter just so that I can make these treats, they are my fav!! I took up driving at a much older age therefore I was not so confident when I started driving. Also the drivers here are simply crazy and many do not obey the law. However with the years of driving, I am ok now. I would love to try out this recipe and that inside part is simply great. Need to make for my friends to try out. I’d drive all the way down there for one of these chocolate fondants! I gotten my license a few years back and I was so stressed during the test! Luckily I managed to pass on my first try 😉 Congratulations on your license! I hate driving! I just can’t drive! Too much stress 😀 I would rather have some chocolate..
What a sweet post! I was jumping with excitement for you CCU — that is such an exciting milestone to have your driver’s licence. Although I imagine this has evolked some sentimental feelings for your parents . . . to see you all grown up and independent. Looks like you celebrated the best way possible — with something sweet. It looks a bit like a molten lava cake? 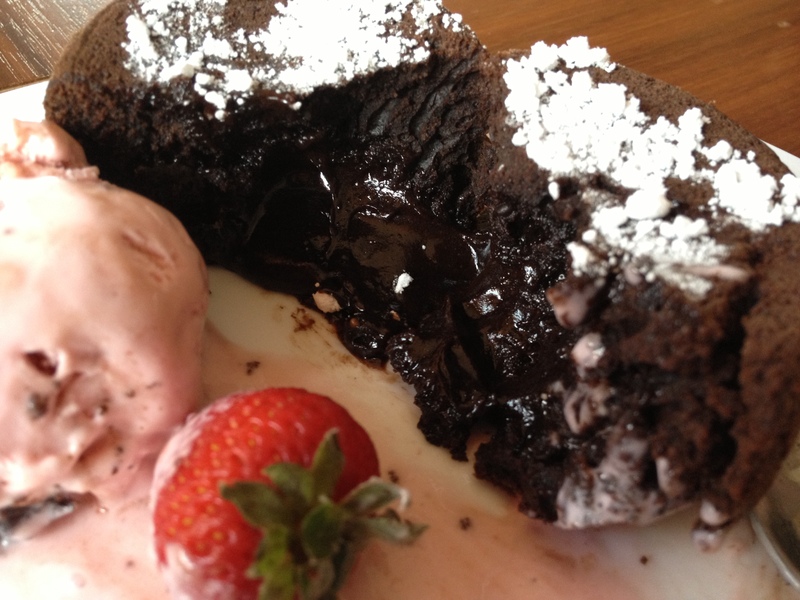 3 point turn for your molten chocolate cake… Yes, of course! OH congratulations 😀 Thats awesome!!!!! Congratulations on getting your license! Great way to celebrate with these heavenly chocolate pots! Congratulations on getting your ‘P’ License. My daughter was very happy when she got her N (new driver’s) First time she drove to school last month she has to text me that she reached safely. Safe rules apply everywhere. Midnight chocolate surprise pudding was a wonderful way to celebrate your milestone. Congrats!! That chocolate dessert looks soo decadent and Amazing! Congratulations on this milestone! Having your driver’s license is awesome and one day, when you get your own car, you will absolutely love the independance. I’m so happy that I got my license when I was a teen-ager. Now I’m a grandmother and I still love the fact that I can take myself anywhere where a car can go! Congratulations on the driving. I remember how that felt! Freedom and independence! These days in this country with the crazy (loco) driving I usually choose to let my hubby drive. Things change. My favorite cake! Good job, Uru, as always. The recipe looks incredibly good ! I learned to drive too long ago to remember details. I do, however, remember taking my son out to practice. We had a car with stick shift (standard) and he got to this one stop sign and the car stalled every time he tried to go. Eventually there was quite a line of vehicles behind us–waiting patiently (I think). It was then we discovered he was trying to take off in 3rd gear. 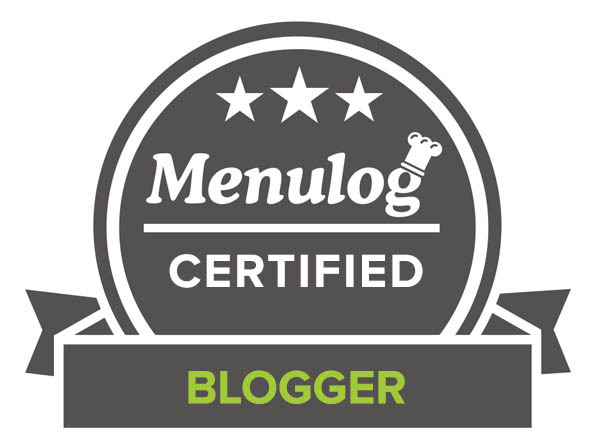 Congratulations on getting your driver’s license, CCU, and on this super recipe! Congratulations!!! Driving is so liberating, it was extra special for me because I had to wait until I was 18 to get my license. That was two years after all of my friends! 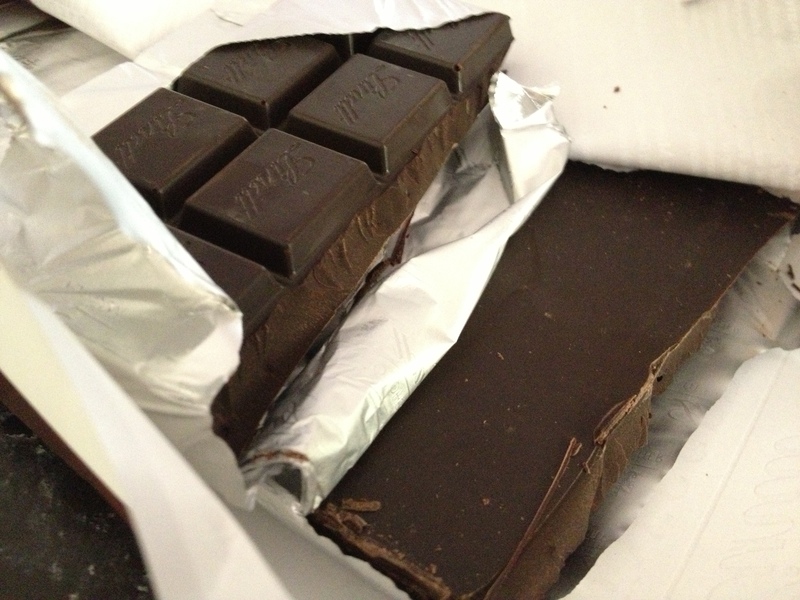 Celebrate my friend, and have some chocolate for me! I remember my first road test, epic failure!!!! The second time was a charm and it seems like eons ago. Have fun, be safe and keep making these fabulous cakes!! I have a trick of the trade for this .. kind of cakes – I do the chocolate mix and then I freeze it and I put a chocolate piece inside the soufflé mixture when poured into the tins. 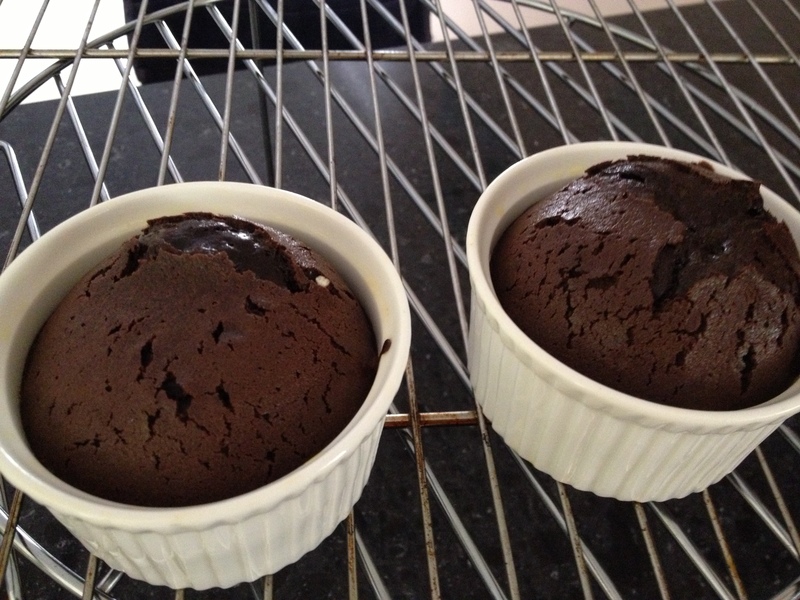 I’m so good on soufflés … *laughing one of the few baking products I master for some strange reason. 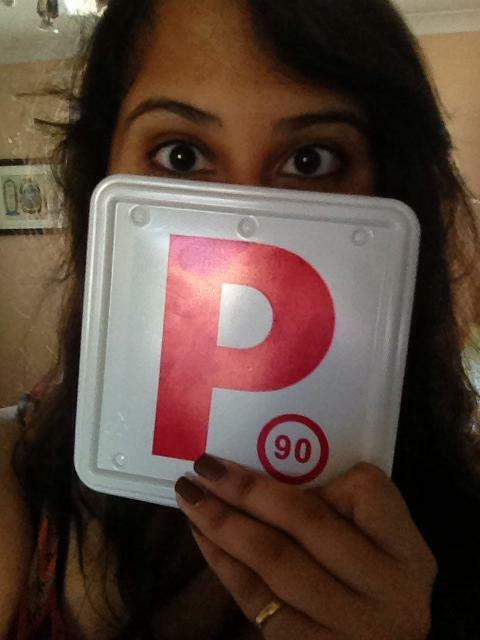 Congratulations to the “P” license … hope everybody in town are staying on the pavement. I can remember uttering that line. The thought of my boys using it on me now though fills me with horror! Congrats on being a driver! I didn’t get my license until I was 23. I know, I know. I just never had a good teacher until then. And… this dessert looks AMAZING. I’m going to have to make it ASAP, because YUM! I love driving and we just got a new car so it is even more fun. Congrats on getting your license, be safe but have some fun! Congrats on driving!!! OMG these look like lava cakes-lovelovelove! Congratulations on your “P” license. I waited until I was 32 to get my driving license as I failed the high school driving course which would have given me a break on insurance and was supposed to give us the confidence to go out and take our REAL driving test. In my defence I didn’t get ANY driving practice at home as my dad drove a van and too impatient so I wouldn’t have been able to practice with him in the car. My mom didn’t drive and my brother … well, let’s not go there. Great dessert though and reminds me that I haven’t made anything with chocolate in a long time. I’ll have to wait til after Lent though. Congrats, Chippy! Now you’re freeeeeeeeeeeeeee to roam about the country. These chocolate puddings are wicked. I haven’t made them in years. I love the gooey hiding surprise! Looks insanely delicious! Congrats! This dish looks insanely good! Congratulations of your new found independence! 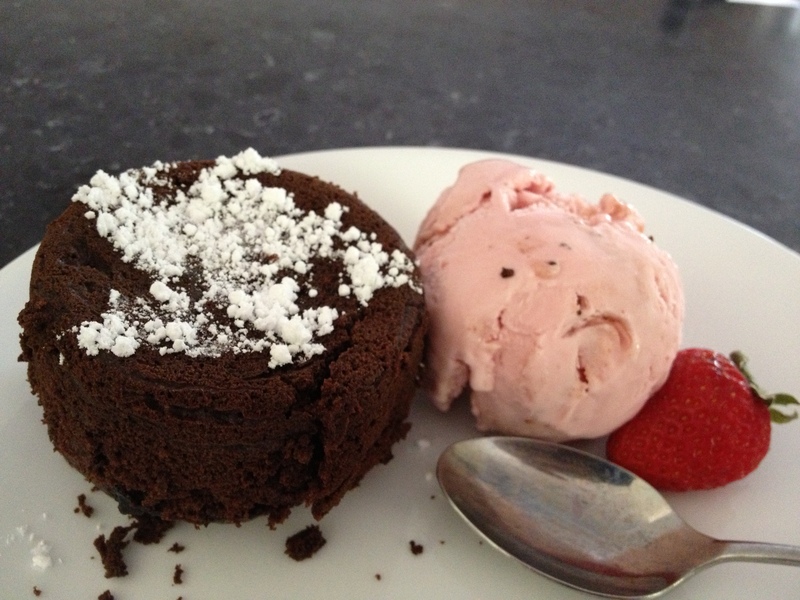 Your lava cake looks gorgeous, great choice for a celebration! Look out, world!! Congratulations on earning your license – have fun and above all BE SAFE! Beep-beep! Congrats on the driving license! Always a big deal, and it’s nice you can wheel yourself around to wherever you want to go. Like going out and buying more chocolate for this amazing dish! Look wonderful – thanks. Well done! And you sure celebrated in style! First of all.. Congratulations! 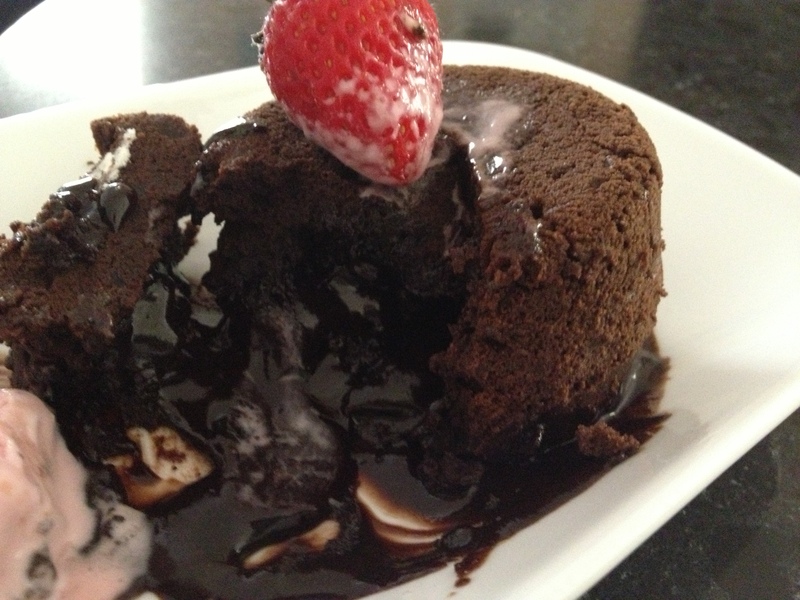 Second, that molten cake looks fabulous! Great job Uru! Oh, Uru. You make me feel old. I remember when I got my license. It was the day before junior prom. Imma be an old fuddy-duddy and impart some words of wisdom: just remember that even though we all think we’re invincible at 17, we are not. Stay safe! Now show your elders some respect and make me some of that pudding! Wonderful Uru! The cake I mean, the driving…… 😉 no you are a responsible young lady, you will do fine! Congratulations! I remember the delight of being independent and then, years later, actually getting my first car. I still love the independence of taking myself out – and the fun of taking others out. First, I have a sweet tooth. The pudding looks divine. Now, more importantly, my son began driving (solo) about two weeks ago. I’ll tell you what I told him: Watch out for the drunks and avoid road rage. Someone will cut you off in traffic. Just get over it and drive safely! Please. Congrats my friend! What a way to celebrate. My 15 yr old has been harassing us to get her started on her drivers ed..it’s hard as a parent to given in to that much freedom! A new chapter in your life! Congratulations! Oh congratulations on passing the drivers test and getting your license. It has been many years for me but I clearly remember the stress mostly because of the state trouper sitting next to you during the road test. Took Drivers Ed in school which was fun, What a great way to celebrate, looks positively delish!! Happy Driving!!! Congratulations my dear!! Oh, I know exactly how your parents feel. I have gone through those initial beginnings with my own children. It is one of the first steps of freedom. And this perfect chocolate delight is an celebration in itself! Delicious 🙂 I love it; especially the surprise inside.., yum!! Love Lindt too!! Happy safe driving!! Congratulations on getting your driver’s license! Ah, sweet freedom huh? I learned to drive beginning when I was about 11 – I drove the truck in our fields as the hands (our farm helpers) picked up rocks or bales of hay, whatever was being loaded into the truck. By the time I was 15, taking driver’s education in school kept insurance costs down (as do good grades) so I took it. Then, at 15 and 1/2 I got my permit. For 6 months a licensed driver had to be in the front seat with me – then, on my 16th birthday I got my real license and a cool red car to which my parents attached a big red and white bow! In rural America, everyone has at least one car/truck/dune buggy/riding lawn mower/golf cart – whatever, ya got to get around out in the sticks! Your recipe looks wonderful and as we prepare for a blizzard tomorrow – I think it will be just the ticket to keep the cold out! Nothing can stop you now Uru! I love to drive, it´s gives you so much freedom. Those amazing chocolate cakes, my god, I can drive to your house and get some I suppose? Congrats on getting your Ps! I only got mine a month ago too (and I’m OLD!). Haven’t really driven solo as I’ve been too much of a wuss but my bf made me drive to the petrol station the other night so I could get over my fears. It was in the middle of the night so there weren’t a lot of drivers. Hopefully it won’t be long before I start driving on long country roads! Congrats on the license. Watch out world :)! And you never know when they come true!